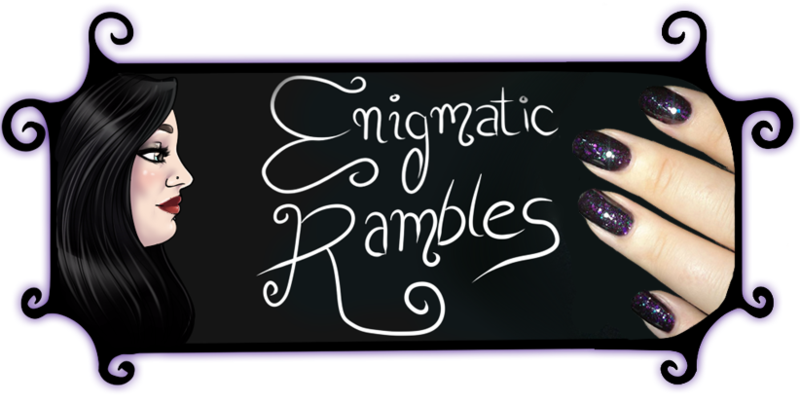 Enigmatic Rambles: FOUR YEAR BLOGIVERSARY GIVEAWAY! 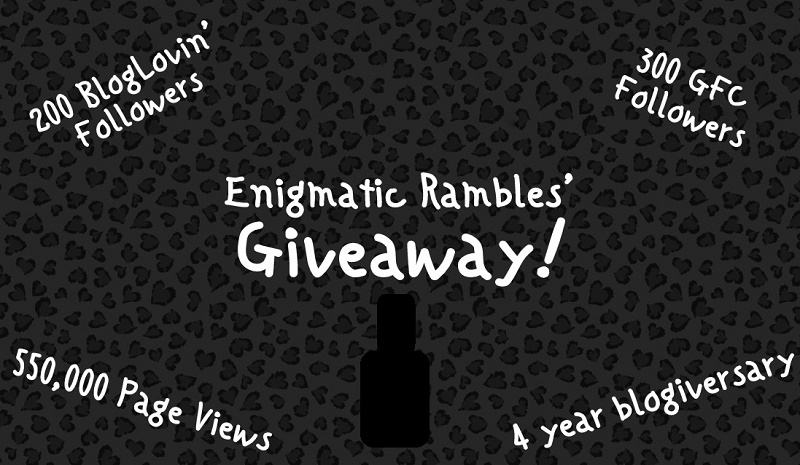 To celebrate the fourth birthday of Enigmatic Rambles I am doing a little giveaway! Thank you to old and new readers, I appreciate every view and every comment very much. Recently I have hit a couple of mile stones, 200 BlogLovin' Followers, 300 GFC Follows and 55,0000 Page Views which is quite a scary but good thing. The giveaway is open to UK addresses only due to postage restrictions and the prize is as you may have guessed is nail polish! I can't enter the giveaway but I want to wish you happy blogiversary!! Happy blogiversary! I like seeing your nail art, especially the challenge one! Happy Blogiversary! I love your blog, how individual it is and all the Lush reviews! Thank you :) I use a lot of scheduling to make my posts regular. I marvel at your use of dark polish. You always come up with something really visually interesting and pretty with it! Congrats on your milestones! I love your gorgeous gothic style! haha just looking through your Pinterest, you have my handbag pinned in 'clothes'. One of the zips was broken so it was only a tenner! Thank you :D that is a bargain for a fab bag! Thank you, I never know about being different, perhaps it is a good thing?! I know this is probably not what you meant but I LOVE your background, it's beautiful. 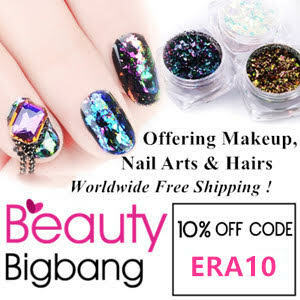 Also your fabulous nail art!